Coffee is derived from over 1,500 chemical substances, making it a highly complex beverage. Approximately 850 of these chemical substances are volatile, while 700 are soluble. The complexity of coffee is dependent on a number of things, such as the species and variety of plant, the way the coffee is grown, and the methodology of how the cherries are picked and processed. As coffee goes through these various stages, the composition of the coffee bean is constantly changing and as you read you will see how these changes affect the final product. The science of coffee all begins with the growing process, where many factors influence the overall quality and composition of the raw coffee bean. Location, altitude, weather conditions, soil and fertilization composition, cultivation, harvesting of the beans, and drying methods are just some of the examples that affect this tiny bean. The Bean Belt originated in Africa and then expanded east and west, eventually forming a belt roughly bounded by the Tropics of Cancer and Capricorn. Coffee plants prefer rich soil and mild temperatures around 70°F, with lots of rain and shaded sun, which is why it grows best in the Bean Belt. All of these elements affect the composition of coffee beans. Below is a chart summarizing the composition of green and roasted coffees (according to variety) and of instant coffee (expressed as a percentage of the dry basis). I bet most of you are not familiar with some of the terminology in the chart above (even I did not know some of the components) so I will briefly describe each and explain why they are important to the coffee bean. 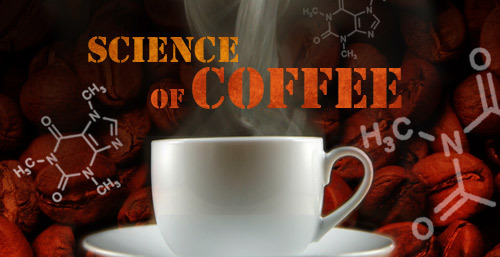 Caffeine is the component most associated with coffee so lets talk about that one first. 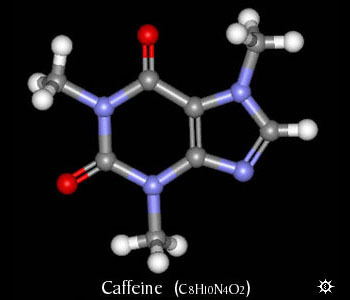 Many scientists believe that caffeine, with its intensely bitter taste, has evolved as a primitive defense mechanism in coffee ensuring its survival in the wild for thousands of years. As you will notice in the chart, Robusta coffee beans have a slightly higher caffeine content than Arabica coffee beans, which is linked to insects attacking the coffee cherries. The insects are deterred by the bitter taste of caffeine and simply move on to the next crop. Since Arabica is typically grown at higher altitudes than Robusta, where the attack of insects is reduced, Arabica has evolved to produce less caffeine. Trigonelline is a less known alkaloid that is very important to the coffee bean. It plays a significant role in the development of important flavor compounds during roasting. Unlike caffeine, which survives the roasting process, trigonelline readily decomposes as temperature approaches 320ºF. At this temperature, 60% of the initial trigonelline is broken down, leading for the formation of carbon dioxide, water and the development of a large class of aromatic compounds called pyridines. The pyridines are responsible for producing the sweet/caramel/earth-like aromas found in coffee. Lipids also play an important role to overall coffee quality. Because Arabica contains about 60% more lipids than Robusta, many believe that this stark difference is one reason responsible for the quality difference between both species. A French scientist who discovered a direct correlation between lipid content and overall cup quality recently confirmed this claim. It turns out that as lipid content increases within the bean, so does overall cup quality. It is a very plausible explanation when one considers that the majority of important flavor compounds in coffee are also fat-soluble. Carbohydrates, such as oligosaccharides and polysaccharides, make up roughly 50% of coffee’s total dry weight by composition. After roasting, remaining carbohydrates contribute to the body from in the cup of coffee. During roasting, proteins combine with carbohydrates in what is perhaps the most important reaction for all thermally processed foods, the Maillard reaction. Proteins also play a role in taste by forming secondary compounds during the roasting process. It turns out that the majority of coffee’s “bitterness” is not due solely to caffeine, but rather bitter compounds produced during the Maillard reaction. Caffeine, as intensely bitter as it is, accounts for only 10-20% of coffee’s total bitterness. 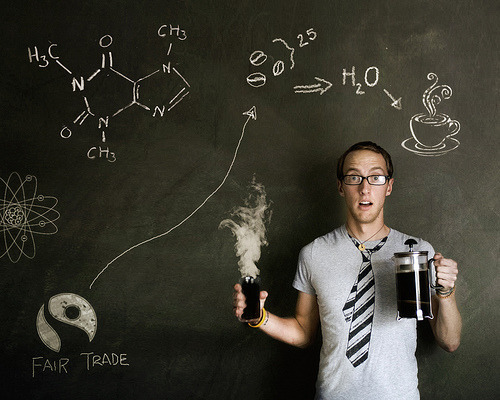 Aliphatic acids exist in coffee mostly in the form of proteins, as amino acids. Coffee contains at least two dozen aliphatic acids including acetic, citric, lactic, malic and pyruvic acid. Chlorogenic acids are the most abundant polyphenols in coffee, which are responsible for a substantial amount of antioxidants found in coffee. Chlorogenic acids also have physiological function in the coffee plant. It contributes to control seed germination and cell growth through regulation of the level of indolacetic acids. It is reported to be involved in numerous biological plant functions such as pest and disease resistance. Additionally, chlorogenic acids play a great role in the formation of pigments, taste and flavor of coffee beans. Roasting is a pyrolytic (heat-driven) process that greatly increases the chemical complexity of coffee. The aroma of green coffee contains around 250 different volatile molecular species, whereas roasted coffee gives rise to over 800! At high heat from 365ºF to 464ºF, sugars combine with amino acids, peptides and proteins according to a well-known caramelization process called Maillard’s reaction (mentioned above as well). The end products are brownish, bittersweet glycosylamine and melanoidins, which give coffee’s dominant taste, along with carbon dioxide. At the same time, a wide variety of lower-mass aromatic molecules develop. These volatile compounds give coffee its familiar fragrance. The higher the final temperature of roasting is, the less desirable the aroma will be and the stronger the bitterness. Here at Black River Roasters, we never roast our beans to the point that the coffee tastes bitter or burned. Our goal is to provide you with the finest cup of coffee by roasting the beans to the degree that will optimize all of the natural aromas and tones found in the bean. Below is a diagram that shows the chemistry of coffee from the article, “The Complexity of Coffee,” by Ernesto Illy. Over 400 billion cups of coffee are consumed every year, making coffee the world’s most popular beverage. It is mind blowing to think that this little cup (or maybe big cup for some) of coffee contains over 1,500 chemical substances; many of which have not even been identified yet. However, the ones that have been identified each have a very important role in making coffee the beverage we know today. Now go enjoy a cup of coffee and remember that this popular beverage is not as simple as you may think. This entry was posted in Coffee Info / Education, General, Health and tagged aliphatic acid, arabica, caffeine, carbohydrates, chemical components, chlorogenic acid, coffee, composition, Ernesto Illy, fair trade, lipid, Maillard reacion, oligosaccharides, organic, polysaccharides, pyrolytic, robusta, science, The Complexity of Coffee, trigonelline. Bookmark the permalink. ← Go Green in Honor of Earth Day!